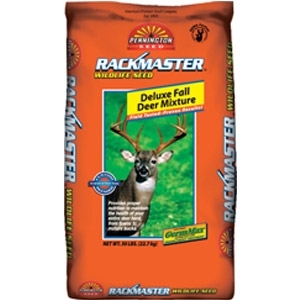 Rackmaster® Deluxe Fall Mixtures contain many annual grasses mixed with annual legumes for attracting deer, quail, and turkey. These fall mixes are regionally developed to provide the best plantings your money can buy for your area. Available in 50 lb. bag. These cool season plots are important to help your deer herd build up the carbohydrates needed as stored fat to survive the harsh winter months. Maintaining good body condition through the rut and the winter stress season will mean the difference in your overall management program. Wintergrazer 70 rye, Arrowleaf clover, Crimson clover, wheat, oats, and Austrian winter peas are just a few of the ingredients you may find in the regionally developed Rackmaster® mixtures.